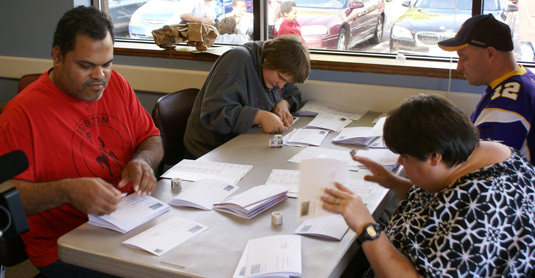 CLA (Changing Lives & Attitudes) supports and enriches the community by providing job experience for disabled adults. Whether cutting mailing, office or production costs for non-profits, businesses, prime contractors, sub-contractors or governmental agencies, CLA is your source for reliable help . In April of 2009, after more than 20 years of traditional service in education, non-profits, Hospice care and elected office, Wendy Benson founded CLA Community Mailings. 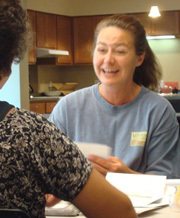 Wendy manages day to day operations and serves as the President and Owner of CLA. CLA provides real, meaningful work to disabled individuals in our community - we're Changing Lives. As a social business the success of our workers is directly tied to the success of our business - we're Changing Attitudes. We began as a small mail house providing bulk rate postage for businesses and non-profits. Clients soon began requesting mail preparation services and our scope of business quickly expanded. In addition to mailing and mail preparation services, we now offer office and production services. We will always work to successfully complete projects in a high quality and timely manner. We are proud to have been recognized as the TSE, Inc. Contract Employer of the Year in both 2013 and 2015. As a job developer, I help people with various barriers to employment. I have come to know Wendy Benson at CLA Community Mailings. Wendy’s keen insight into difficulties for those unemployed as well as her mission of changing lives through employment, has been manifested in, “Lynn,” a job seeker I am currently working with. Through Lynn’s work with Wendy, her self-esteem and pride are matched by her confidence, knowing her work at CLA will aid her in securing a long-term job. Thank you so much for getting our mailing out so quickly. Answer a few questions and we’ll let you know how much you will save!